Since the mid-1970s there have been claims that elements of the Apollo program and its associated Moon landings were staged by NASA. A growing number of people maintain that the lunar landings were faked and that the Apollo astronauts did not actually walk on the Moon. In this paper we analyse some of the Apollo lunar surface images through computer software and basic scientific reasoning in order to prove or disprove whether the EVA photographs were staged. We examine some of the most outstanding cases through the use of Photoshop® and Google Earth (Moon) applications. The resultant image analysis demonstrates that the Apollo photography was staged, manipulated and/or altered. Consequently, the Apollo lunar surface photographic record cannot be relied upon as evidence of humans walking on the Moon. Google Earth (Moon) simulations also indicate that in the case of Apollo 17, the mission was staged. The Apollo moonscapes used were inaccurate presentations of reality with incorrect elevations and serious lunar feature omissions. An Apollo 15 mission panorama as presented in Google Earth (Moon) leads to the same conclusion. Since the mid-1970s there have been affirmations that elements of the Apollo program and the associated Moon landings were hoaxed or staged by NASA on Earth. The first book making such claims was self-published in 1976 by Bill Kaysing (1922–2005), titled We Never Went to the Moon: America’s Thirty Billion Dollar Swindle.5 Kaysing’s book contained many allegations and launched the discussion. As Bill Kaysing pointed out, the chance of a successful manned landing on the Moon was calculated to be 0.0017%, and despite close monitoring by the USSR, it would have been far easier for NASA to fake the Apollo program than to actually go there. On the other side of the argument many voices from mainstream scientists and “moon-landing believers/supporters” have been raised as a reaction to the “anti-moon landing” movement by offering a number of explanations and facts that, according to them, constitute undeniable proof of the lunar landings (see11 and references therein). In the present paper we examine some of the many allegations made in support of the staging or manipulation of photographic images and TV recordings that stand a chance of being correct. The analysis was carried out with computer software appropriate for the examination of information conveyed in any given image that goes beyond the technical ability of film image manipulation available at the time. Every effort has been made to enable the majority of the information contained in this article to be accessed through the Web. We have chosen as a main reference the claims presented by Aulis Online12 stating that ongoing analysis of the Apollo imagery (recorded 1969-72) suggests that the lunar surface photographs were faked. Our analysis follows for several images and different missions. Versions of Apollo 17 image AS17-134-20384 exist in2-3 which display no photographic anomalies. An older version of the same image could be downloaded until recently (2016) from “Great Images in NASA (GRIN): Space Exploration”, as shown in figure 1. The picture shows geologist-astronaut Harrison Schmitt, the Apollo 17 LM pilot, photographed next to the US flag with the Earth above in the background. The photo was taken at the Taurus-Littrow landing site. Viewed with the naked eye no variation in the black background of the image is noticeable (figure 1a). However, changing the gamma of the photo with Adobe Photoshop® software,14 it appears that the image is in fact a composite. Very simply described, gamma correction is a nonlinear operation used to decode the luminance (or light reflecting off the print) of the image. As seen in figure 1(b) the astronaut is from one source and the flag and the Earth is from another. One can observe the reflection of the flag on the visor as belonging to the flag part of the photo, positioned professionally on the ‘correct’ part over the astronaut’s visor. Note also that the astronaut element contains no colour information as it is a monochrome (greyscale) image. In some of its websites NASA seems to have retouched photos in order to repair scratches or blemishes in old scans or duplicates, as ascertained in15. Here the separation of the image in two parts is clearly the product of retouching as shown in figure 1(c). Figure 1(c) shows a new version of the image published on flickr.com13 in October 2015, where a clearscan from the original is displayed. It is obvious that a crude selection was performed for retouching purposes in order to remove the colour from the astronaut part of the image, perhaps to emphasize the presence of the flag and its reflection in front of the Earth. We should stress that the images in4 (figure 1, a–b) were intended to be used by the media, publishers and others seeking high quality photographs. The complete composition (figure 2), from which portion a11.1103147_mf is a part, can be found at Buzz’s plus-Z pan.3 The complete composition includes AS11-40-5881 to 5891 and was assembled by Dave Byrne. The portion showing Neil Armstrong during Apollo 11 at the MESA was assembled by Mauro Freschi3 and is shown in figure 3(a). Figure 2. Apollo 11 Buzz’s plus-Z pan. When the image is corrected for gamma, the contrast enhanced and the colour saturated, the outcome is shown in figure 3(b). Immediately one observes that there are corrections in the composite in the form of thick lines that could be drawn with an analog to the eraser or brush tool of Adobe Photoshop®, or in a similar process (actual brushing on film). Figure 3. (a) Apollo 11 composition a11.1103147_mf, (b) a11.1103147_mf enhanced to show brush lines marked with A, (c) enhanced further to show different light intensities in the background, (d) various types of stage lighting. This first group of artifacts is marked A on figure 3(b) and obviously the purpose was to erase unwanted details in what should be a totally black lunar ‘sky’ – for instance glare, or details that might draw unwanted attention. By further increasing the gamma correction and exposure (the amount of light per unit area, i.e. the image plane-luminance times the exposure-time reaching the photographic film) one observes various light densities in the black background of the image. In the left-middle area there is a large dome shape (probably an intense light source), and located further to the right are a number of virtually identical radiating cones overlapping, indicating smaller light sources. Observe the similarity to stage lights in figure 3(d). This second group was on the original image before editing took place. As we cannot explain the second group of artifacts in any other way, it is highly likely that these images were staged. The primary light source, the sun, is to the right of the astronaut as in the posterized image (i.e. conversion of a continuous gradation of tone to several regions of fewer tones, with abrupt changes from one tone to another) and coloured, with the sun-reflecting area glowing white. There is also a pentagonal lens flare on the image at the top left, which is normally produced when the camera is turned towards a direct light source. In this image there are two additional circles of light symmetrically above the astronaut. The light intensity is higher on the top of the image and seems that light is thrown on the surface apparently illuminating the area behind the astronaut. There can be no other physical explanation for this, unless there were clouds, smoke or electrically-charged, suspended particles in the vacuum atmosphere of the Moon. An image search shows that AS12-49-7201,3 taken at 132:32:06 hours from the beginning of the mission (i.e. about a half hour before figure 4a), was shot by Pete Conrad at the beginning of a pan at Triple crater. This photo (figure 4b) is the view just to the right of up-sun and of the northern rim of Head crater. It turns out that in this case exactly the same two circles of light at the top of the frame are illuminating the area, the pentagonal lens flare is in virtually the same spot on the image, the rays of the sun, and even the bright spot reflection at the left edge are all identical to those on AS12-49-7278 in figure 4a. The same photographic anomaly appears in images AS12-49-7262, AS12-49-7294, AS12-49-72953 (figure 5). When posterized the variation in tones is profound (figure 5b). This is very peculiar because it means that either there was something physical there, which (i) registered when the camera was turned towards it, or (ii) it was associated with the sun’s rays hitting the camera lens at exactly the same angle. Figure 5. (a) Same photographic anomaly of circles of light with varying intensity on Apollo 12 mission photos AS12-49-7262, AS12-49-7294, AS12-49-7295,3 (b) images after posterizing. To examine the second possibility (ii) above, we study the reflection of the sun through panoramas assembled by NASA.3 As seen in figure 6, although the sun’s image and reflectance varies, and the pentagonal lens flare changes position with respect to the horizon, the location of the two background circles of light does not change, which means that they cannot be flares caused by the sun. Figure 6. 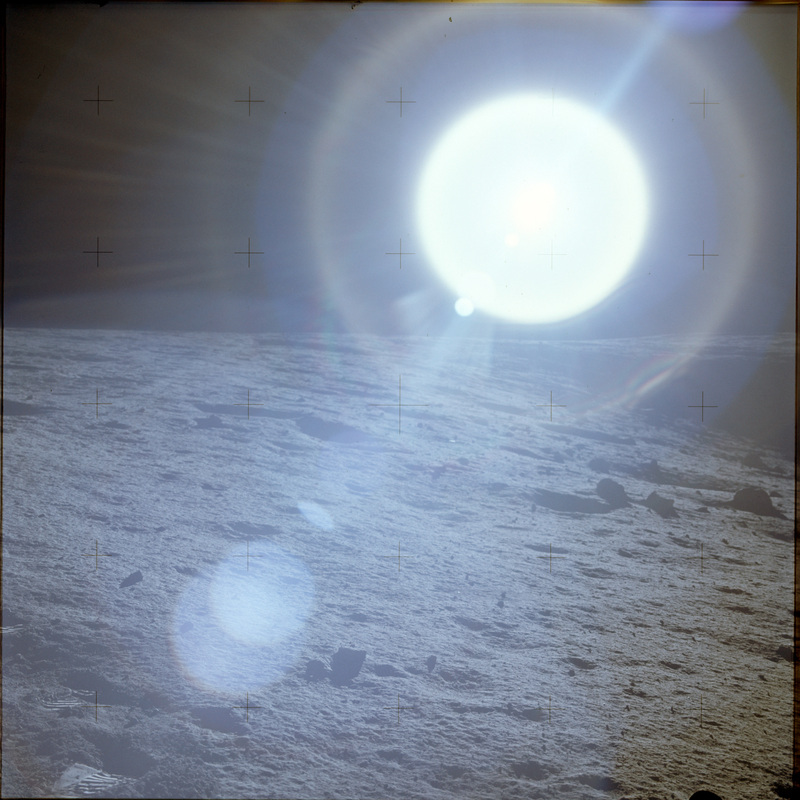 Apollo 12 panoramas by NASA.3 The sun’s image and reflectance varies, and the pentagonal lens flare changes position in respect to the horizon, but the location of the two background circles of light does not change. Hence, unavoidably, there may be a third scenario: the entire scene was staged. In this case a number of light sources could have been used in order to maintain uniform lighting across the entire scene illuminated by the main light(s). This might have been necessary as the sun produces uniform illumination and there is no atmosphere on the Moon to absorb/diffuse the light. We proceed now to examine the image of the sun. Figure 7 shows the sun in three colour panoramas. The light seems to be spread very evenly, without any irregularities at is periphery. Figure 7. The sun in three colour panoramas from Apollo 12. The light seems to be spread very evenly, without any irregularities at is periphery. The caption below each figure indicates the mission elapsed time and the panorama name. Figure 8. Apollo 12 AS12-46-6739 and AS12-46-6739-67662 (first row) compared with photos of the sun taken above the atmosphere (second row) and from the ground (third row) during a day of high humidity. All images processed with the Photoshop® gradient mapping tool. We compare two individual Apollo 12 images AS12-46-6739 and AS12-46-6766 and images2 with photos of the sun taken above the Earth’s atmosphere, shown in the second row of figure 8. The first, S129-E-007592 (22 Nov. 2009), shows the sun and the International Space Station, photographed by one of the STS-129 crew members and downloaded from here. The image next to it is from the STS-77 shuttle mission in 1996, downloaded from here. Additionally, in the third row we present our own sun photographs taken at different hours of the day. All the images are processed in exactly the same way for easy comparison, in this case with the Photoshop® gradient mapping tool (which maps the colours of a gradient, defined by the user, to the luminance values of an image). Of particular note is the considerable difference in ‘roughness’ around the sun’s periphery. However, in the Apollo 12 images (first row of figure 8) there is a bright centre (the lamp? ), a ring that has lower luminance, a third ring (the reflector? ), a very thin and dark ring (the casing of the lighting) and so forth. Not only the light source itself, but also the thickness of the rings do not correspond with the sun as seen from space (second row figure 8), nor with the sun photographed through the Earth’s atmosphere (third row figure 8), smoothing its irregularities. On an actual image of the sun the disc is so bright that no graduations of brightness can be distinguished on the film or recording medium. Also the disc is the brightest part and the brightness gradually diminishes outside the disc. No outer part of the disc is as bright as the centre. All totally different characteristics to the Apollo photos of the sun. Other peculiarities also attracted our attention when examining the above Apollo 12 photos. Observe the three images AS12-46-6739, AS12-46-6762 and AS12-46-6766 obtained from2 and shown in figure 9. Figure 9. Apollo 12 images AS12-46-6739, AS12-46-6762 and AS12-46-67662 with details enhanced. When area A is enlarged one can observe that the reticle or fiducial cross throws a shadow onto the layer below. One possible explanation is that the cross was on a transparent overlay while making a copy of the image comprising one or more layers that did not touch exactly. Moreover, the layer was not flat, producing the ‘<’ anomaly on the sun, and the corresponding diffraction produced the rainbow colouration when re-photographed. The same anomaly is observed in AS12-46-6762 at B. The shape of the sun is not affected in the next image AS12-46-6766 but the fiducial cross at C throws a shadow onto the film below. Let us now examine the observation by photo analyst Jack White that the light ‘domes’ observed in some images were not lens flares but elements of a domed studio, and associated with lights illuminating the set.12 Such a case is image AS15-89-120152 from Apollo 15. Although available only in low resolution (see figure 10), it can be seen that there appears to be a fixture or rig at the top of the frame. Needless to say that the same image found in high resolution is trimmed all around (cropped).3 However, the publication of the complete scanned frame in October 201513 shows that the anomalies are numbers scratched onto the edge margin of the film. Figure 10. 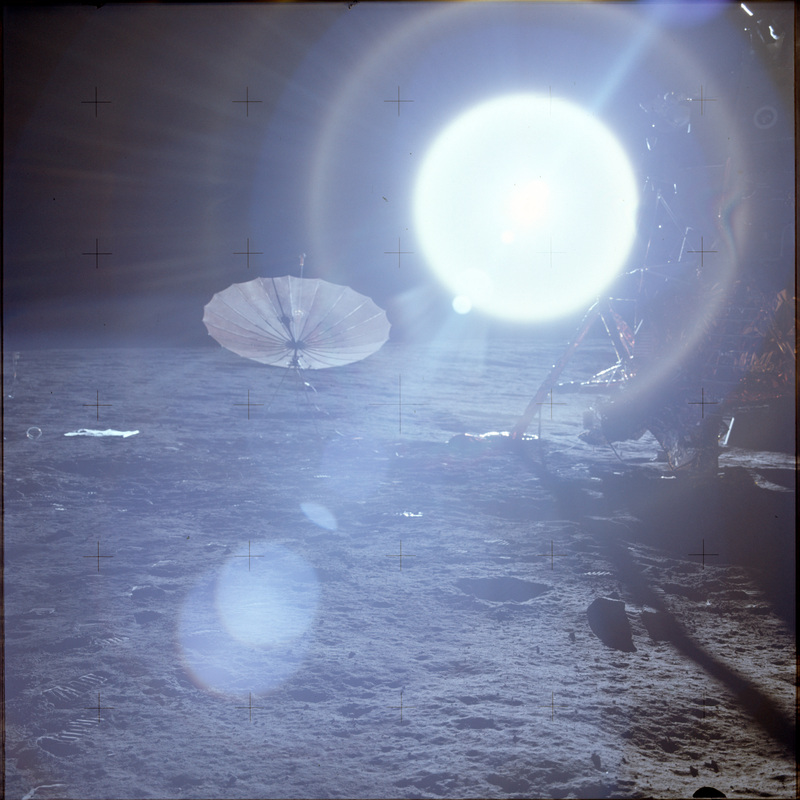 Comparison of Apollo 15 images AS15-89-120152,2,13 indicating that ‘spotlights’ are actually numbers scratched on the margin of the film. In the Apollo 15 record there are a number of images that could be interpreted as having been illuminated from above or the sides. As can be observed in figure 11, AS15-87-117422 shows clearly that the scene is illuminated from the top right with what appears to be a large conical light. Also observe that there is a reflection on the casing of the light, and its rim is clearly distinguished (insert is in high resolution – see also separate investigation below). Another case is AS15-87-118122 where it is impossible for the sun to illuminate the black sky with an inclined beam from left to right while leaving the upper right corner without any illumination. As explained in3 the sun should be to the right of this photograph. Figure 11. 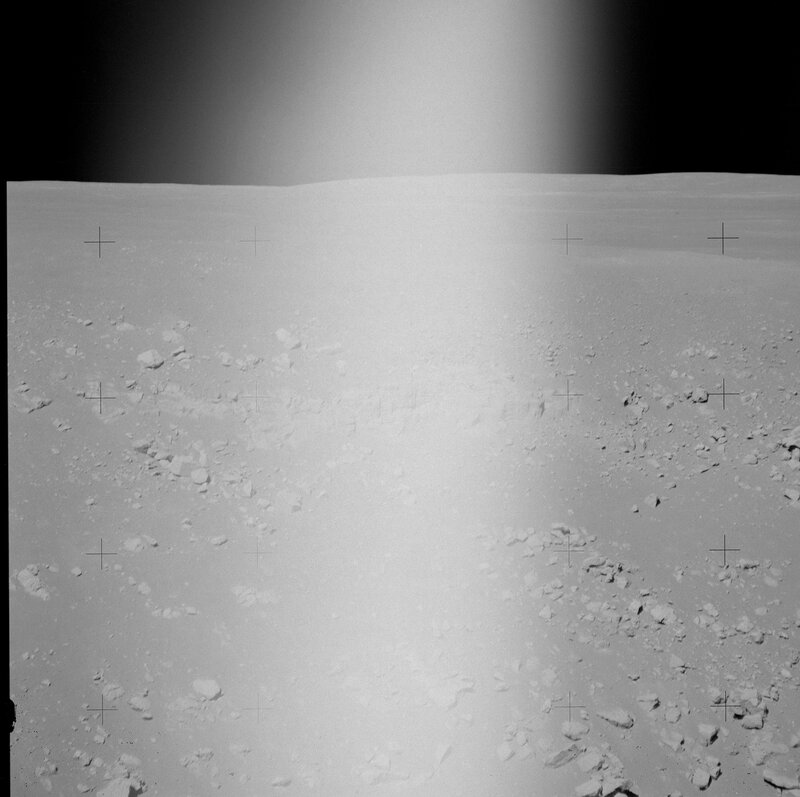 Apollo 15 photos AS15-87-11742 and AS15-87-118122,3 showing artificial illumination. Returning to AS15-87-11742, let us take a closer look to further justify the comment made above regarding a stage light with its rim clearly distinguished. As shown in figure 12 (upper), a panorama can be produced by photomerging in Photoshop® images AS15-87-11737 to AS15-87-11746. It is evident that the position of the light was above the LM. The picture was taken from the top of the LM, between the dish antenna (A) on the left and antenna (B) on the right, above the fixture on the inclined surface (C) (see figure 12 lower). The conical nozzles (D) can just be seen below the fixture. This means that the rim of the nozzle is not the one depicted in AS15-87-11742. Also notice that the same type of lighting was used symmetrically to present the reflection at the right side of the sun. Figure 12. (Upper frame) Photomerging with correction of geometric distortion in Photoshop® of images AS15-87-11737 to 463 to show the relative position of each image and (lower frames) AS15-88-118663 and enlargement to show the top of the LM. The above examples are not the only ones depicting studio lights; there are other cases which are rather more obvious. Let us examine some Apollo 12 images showing the reflection of lights in an astronaut’s visor. As seen in figure 13, the photos show the reflection of a row of lights in a visor.3 In all but the last one (AS12-49-7281) there is a peculiar reflection of another piece of equipment at the right of the light series hanging together at the same relative position, despite the fact that the scene, the position on the visor, and the film reel change. This implies that scratches on the visor or lens impurities cannot serve as candidates for these reflections. Figure 13. Eight images from3 showing reflection of a series of lights in an astronaut's visor. In the first four there is also a peculiar reflection of a piece of equipment at the right end hanging with the lights, although the scene, the position on the visor and the film reel change. In October 2015 the Project Apollo Archive13 was made available on flickr.com. 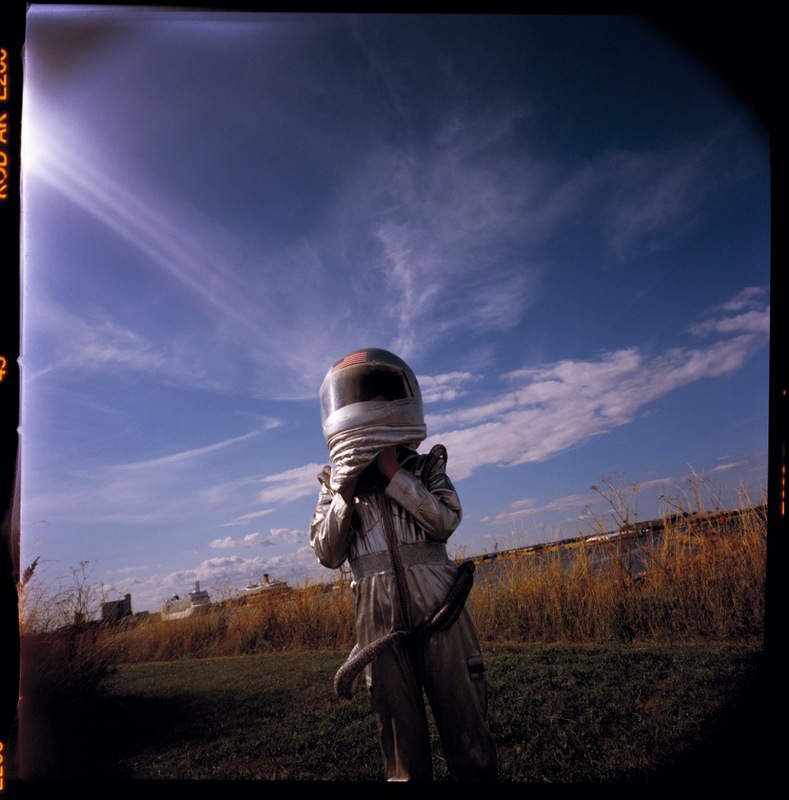 This new gallery is a private effort by Kipp Teague and is not a NASA undertaking, involving the re-presentation of public domain NASA Apollo imagery (film scans) as originally provided by the Johnson Space Center (JSC) on DVD. At this point we should mention that the Hasselblad still images can be ordered by individual frame, magazine, or as a complete set. Entire magazines or sets of the Hasselblad photography can be produced as positive or negative contact film duplicates on 70mm roll film or as positive contact paper prints on 70mm roll paper.16 Therefore, the vast majority of the images presented on Flickr are claimed to be scanned by JSC from original Hasselblad film rolls, and are in their raw, high-resolution and unprocessed form. In other words, they are not film copies or from paper prints that were re-photographed and, consequently, every anomaly shown on Flickr is on the corresponding original film image. In a camera fitted with a réseau plate, the film was guided by the raised edges of the plate.19 In the Data Camera static electricity built up and could create sparks. To conduct static electricity away from the réseau plate, the side of the plate facing the film was coated with an extremely thin conductive layer, which was led to the metallic parts of the camera body by two contact springs. Contact was effected by two projecting silver deposits on the conductive layer.19 Additionally, the square format of the film, which produced an image size of 56×56mm, meant that the camera did not need to be rotated for vertical photographs as cropping could be applied during post production.20 The réseau plate was 54×54mm in the film plane21 and the contact positive or negative film copies have an image area of 52×52mm.22 Below in Figure 14 are some pictures of the Hasselblad 500EL Data Camera with its réseau plate to be found online. A tour around the new Flickr gallery reveals the variety of image borders, and Figure 15 below shows a number of the various border types. There seem to be some consistencies, for instance images taken on the lunar surface have a line on the left and the right side edges, plus a black mark on the top left and bottom right. The réseau plate does not appear to exhibit any irregularities at the sides. In the case of figure 15(a) the lower part of the image number is also present on the right side border (changing with every picture on the film). This indicates that the scanned borders of the original film cover both the image area and part of its margins on the film, clearly signifying that the lines on the left and right sides are registered on the original image and were not formed during the scanning process. Figure 15. Images from the Flickr gallery13 depicting various margins. Other examples are shown in figure 15(b)-(c). It is worth noting that figure 15(c) has some additional irregularities with the film image not being parallel to the edges of the film, showing an additional line at the bottom edge that intersects the black mark at the bottom right. There is another faint line on the top side border and the light source bleeding outside this border. When enlarging this part (inset), one can also observe that the reticle/fiducial positioned on the right of the bright area, around the sun, throws a shadow. This gives the impression that the image was a composited, layered photo. Also as observed in figure 15(d)-inset, there are odd markings that extend into the picture area on the left and right sides of the frame. A second category shows images taken during the flight as in figure 15(e), where there are no fiducials recorded as they were taken with a camera not intended for lunar surface imagery. A neat square border with two small Vs in the middle of the left side of frame are visible (inset). This type of left border is correct for a standard Hasselblad camera (see for example an Ektachrome exposure23). A third category is shown in figure 15(f) where the photograph number is at the bottom of frame. There is a hand-written number on top and the black marks are on the left and right sides. This indicates that the picture was taken with the camera rotated 90° in respect to figure 15(a). An internet search shows17 that the correct orientation is that as indicated in figure 15(a) (see also figure 16). One cannot imagine how an astronaut could rotate a Hasselblad camera fixed to his chest, at 90° to take a pan, unless the chest fixture of the camera itself could be rotated. Recall that the image area of the camera had the same height and width to make rotation unnecessary. Additionally, there are film magazines that include a mixture of the above categories, as in Apollo 11 Magazine 39/Q (B&W).13 For example, images AS11-39-5794 and AS11-39-5796 show the two Vs in the middle of the left side of the frames, the number markings on the right side and the depicted horizon on top as it should. In contrast, AS11-39-5795 has the number markings on top, above the depicted horizon, and no Vs on the left side. Image AS11-39-5770 and AS11-39-5780 have multiple lines on the left and right side of the frame with no Vs in the middle of the left side. Figure 16. (a) A roll of Hasselblad colour positives (Mag 40) from Apollo 11, sold by Bonhams for $23,750.00 in 201224 and (b) Image AS11-40-5868 showing that the correct orientation is as presented in figure 15(a) and not 15(f). Some other noteworthy facts: As shown in figure 17, magazine AS12-49 exhibits an edge clip in every picture at the same position as in image AS12-49-7270. The same type of clip appears in magazines AS12-46 (top left), AS12-48, in AS12-47 (as for example in AS12-47-6871 with the image rotated 90° for photographing the original), and so forth. Figure 17. An edge clip appears to hold down individual images reproduced on the “original” Apollo 12 magazines. Let us take a look at Apollo 17 film magazine B, No.134. In this roll all the photographs have the same abnormalities characterizing images taken on the Moon. There are only two exceptions, AS17-134-20470 and AS17-134-20471, shown in figure 18, which seem to be rotated by 90°. We wonder how and why an astronaut would take the trouble to rotate the camera for just these two images and then revert the orientation back to normal. It is more realistic to believe that this occurred when taking the original unprocessed photo. Hence when assembling the “original” film roll it was not logical to present the United States flag rotated by 90°. Figure 18. Comparison of three images from magazine AS17-134 of which, judging by their abnormalities, two images (AS17-134-20470 and 71) were recorded wrongly on the film as they were rotated by 90°. To complete this section we now superimpose two image frames onto a Hasselblad réseau plate. This was carried out in Photoshop® by adjusting the image sizes to match the réseau plate in figure 14 (right). In this exercise the réseau plate reticles/fiducials are matched with those in the image – flipping the image horizontally and vertically. Figure 19 (top) shows the comparison of image AS12-49-7192 obtained from Flickr.13 The red squares are cuts on the film exposing the camera details underneath. Detail A shows that the film passes under the réseau plate edge without any visible distortion of the recorded image. Apparently, somehow light from the camera lens (from the back of the plate) hit the film under the plate and produced a continuous image on the film. Moreover, it is difficult to explain the straight lines on the edge of the film and the change of brightness on the area below the plate edge – unless the image was re-photographed. The detail B, the ‘clip’, seems to be a very elaborate item (with an undefined role), just 2.48mm long (measured with the Photoshop® analysis tool). Given that it has a razor and a pin at its ends, one might conclude that the actual size was approx. ten times larger. A razor and pin were useful tools for manipulating film and it is surprising that this ‘clip’ has not been commented on before. Figure 19 (bottom) is with AS15-85-11367. Again, the exposed film image passes under the réseau plate edge and the thick line on the edge of the film has no relation to the camera body underneath. All the images used by the media and in the ALSJ3 are trimmed prints or enlarged parts of the images shown in the Flickr gallery.13 This can easily be verified by matching the reticles/fiducials on any image in3 to the corresponding image in13 and observing that all the irregularities appearing in13 have been excluded. In this section we present a comparison of Apollo 17 photographs and composites with Google Earth simulations. We have chosen this mission as it was performed in complex terrain and the likelihood of any errors in model presentations is high. Apollo 17 photos AS17-145-22166 to AS17-145-221833 were merged in Photoshop® to create a composite panorama. Additionally, Google Earth (Moon) was used to simulate the same view from ground level. Because an on-screen view does not cover the full span of the Apollo 17 merged composite, a series of screen shots were taken and then merged in Photoshop®. The result is the Google Earth composite in figure 20(a). In figure 20(b) the simulated and actual views are compared. As there are considerable differences, the simulated composite was scaled between reference lengths indicated by the numbered vertical lines. Between lines 1 and 2 observe the dissimilarity at left mountain base. Between lines 2 and 3 there are differences – only one ridge is visible in the simulation. Between lines 3 and 4 there is a great dissimilarity in the detail of the mountain contour. This would appear to mean that either there is something wrong in the Apollo photographs, and/or the data used to generate the simulations in Google Earth (Moon) are faulty. Figure 20. Comparison of merged Apollo 17 photos AS17-145-22166 to AS17-145-221833 photographs and Google Earth (Moon) simulation. Figure 21. (a) Merged Apollo 17 photos AS17-145-22166 to AS17-145-221833 where the LM is visible (enlargement), (b) Elevation profile between Station 5 (left) and LM (right) showing that the LM could not be seen from this position. In the above merged photographs we point out the location of the LM (inset at the right of the image) as shown in figure 21(a). In figure 21(b) the elevation profile between Station 5 (left) and LM (right) is shown together with a plan view of the two points in a Google Earth (Moon) simulation. As clearly shown the LM could not be visible from this position since the rim of the Camelot crater stands in the way. Next we examine a composite that has raised much discussion (for instance see12). This picture at Split Rock (figure 22a), is a composite of two images, AS17-140-21494 to the right of the scene and AS17-140-21497 covering the area to the left. Figure 22a was produced automatically with photomerging in Photoshop®. The position of the Apollo 17 LM is indicated and enlarged in the inset. The position of the Apollo 17 LM is in the enlargement. Figure 22(b) is AS17-139-21204,3 which corresponds to the inset of 22(a). Figure 23. Station 6 as simulated by Google Earth (Moon) and the relative position of the LM. Figure 23 shows station 6 as simulated in Google Earth (Moon) and the relative position of the LM. Figure 24 is the view from Station 6. The LM is exactly at the position as shown in figures 22(a) and 22(b) but in this case the LM cannot be seen because the sightline continues beyond and above the hills. This is illustrated in figure 25 below, showing the Google Earth elevation profile of the area between the LM and station 6. Figure 24. View towards the position of the LM from Station 6 as simulated by Google Earth (Moon). The red line marks the direction of the LM. A Google Earth elevation profile of the area between the LM and station 6 is presented in figure 25. The position of station 6 (figure 25) is at the far left and the LM is at the far right. The slope where the LM is positioned has an inclination as illustrated by the green line; therefore a much higher position than station 6 is necessary in order to observe the LM. The sightline from station 6 is indicated by the orange line showing that the LM is below the sightline by 10 metres (insert top right figure 25). Figure 25. Google Earth elevation profile of the area between the LM and station 6 indicating that the LM could not be seen from this point. This finding is further illustrated by a side view of the lunarscape along the sightline shown in figure 26. Figure 26. (a) Side view with red line joining the LM and Station 6 Google Earth (Moon) showing the incline. (b) Depicts the end of the hill where the LM rests, and (c) from the top of the hill where the LM rests. Consequently, one can consider the above to be a realistic representation of the moonscape irregularities, whilst failing to be presented accurately in the model. Next, we present another important declination between the Google Earth (Moon) simulation and the composite of images AS17-140-21494 and AS17-140-21497 of figure 22(a). As seen in figure 27, pinnacle A, behind Bear mountain, is missing from the Apollo photograph. Mound B has a far more extensive slope than in the Apollo image, and mound C is also missing. Finally, mounds D and E present a different left slope. A closer view of the missing features of figure 27 is presented in figure 28. Figure 28. Missing surface features in the composite of images AS17-140-21497 and AS17-140-21494 Google Earth (Moon) views. The same omission can also be observed in AS17-134-20513,3 which is in colour and high quality (figures 29a-b) and panorama JSC2004e527752 (figures 29c-d). Figure 29. Missing land features in the composite of AS17-140-21497 and AS17-140-21494 (AS17-134-205133 and panorama JSC2004e527752 and their corresponding Google Earth simulation). The pinnacle and mound are also missing from the photos in the Google Earth (Moon) interactive 3D presentation of Apollo 17. Figure 30, centre, is the photo that can be accessed from station 6, named ‘The Boulder and the View from Station 6’. Rotated to the specific direction, the enlargement shown on top can be obtained. From exactly the same location the view of the simulation is that as presented in the bottom, where the pinnacle and mound are clearly shown. Figure 30. Middle: ‘The Boulder and the View from Station 6,’ image in Google Earth (Moon). Top: Area enlargement. Bottom: Simulated view from exactly the same location. Figure 31. View from Station 5. Simulation in Google Earth (Moon) compared to an enlargement of the same area taken from image AS17-145-22166.3 The mound to the rear and right of Bear mountain should be visible. Checking the Apollo 17 video recordings of the TV coverage we observe the same inconsistency. A still from the video clip25 is presented in figure 32 and speaks for itself. The imagery in Google Earth (Moon) contradicts the Apollo photographic record. Perspective views shown in some panoramas and the simulations generated by the software show discrepancies. Also lunar features like surface anomalies and foreground hills differ. As an example we present the view from the Apollo 15 ALSEP site, as presented in Google Earth (Moon) simulation, and compared to the panorama from actual mission photos, embedded in the software (figure 33). We will leave it to others to observe differences in other missions. The Apollo images and Google Earth (Moon) data are provided by legitimate U.S. establishments, with the Google Earth data expected to be more accurate as a result of continuous photographic and mapping activities from the Apollo era onward. Figure 32. Apollo 17 video still frame,25 in which the pinnacle and mound are not recorded. Figure 33. The View from the Apollo 15 ALSEP site as presented in Google Earth (Moon) simulation (top) compared to the mission panorama assembled from actual mission photos, embedded in the software. Observe the difference in the surface configuration in front of the mountains and the missing hills marked by ellipses. In this paper we have analysed a number of the Apollo images by using computer software and basic scientific reasoning in order to investigate whether staging the Apollo photographic record might have taken place. Here we have examined a number of cases with the use of Photoshop® and Google applications. The result of these comparisons of composites of actual photos of the Apollo 17 mission and simulated views in Google Earth (Moon) reveal considerable differences in perspective. In some images the LM is shown but the elevation profile between the point of taking the photograph and the LM is such that the LM could not be visible from that position. Furthermore, missing land features in the Apollo photos and video recordings compared to the Google Earth (Moon) simulations indicate staging of the landings and the EVAs, unless some recent event (meteoritic or otherwise that has not been recorded) has produced the discrepancies in the moonscape. The same findings also apply to other Apollo lunar EVAs. The results of this detailed image analysis has demonstrated conclusively that scenes were staged, and images were reworked, retouched and/or altered. Based on all of the above, it is clear that the accessible Apollo photographic imagery as well as the broadcast television recordings of the 1969-1972 Apollo missions cannot be accepted as proof of humans walking on the Moon. Pyrrhon Amathes PhD is a qualified engineer and artist, an ex academic and currently an independent scholar living in Ampelokipi, Athens, Greece. Paul Christodoulides PhD is an applied mathematician and an Assistant Professor in the Faculty of Engineering and Technology of the Cyprus University of Technology. He has over 100 refereed book, journal and conference publications.